Swedish hard rockers CRAZY LIXX are back with another gem of an album that harkens back to the best of ‘80s hard rock, while also keeping a foot firmly planted in the 21st century. Forever Wild further cements the band's status as one of the leaders of the Scandinavian led hard rock revival, cleverly melding a sleaze/hair metal approach (reminiscent of MOTLEY CRUE, WARRANT and WINGER) with voracious hooks and melodies. See the first video and new single, "Break Out" on KNAC.COM HERE. With huge choruses, instantly memorable riffs, wailing, emotive guitar solos, and massive production by Danny Rexon and Chris Laney, Forever Wild is sure to resonate with old fans and new listeners alike. Singer Danny Rexon says, "Ruff Justice was the first album where I took on the full role of producer, including recording, engineering, editing and some of the mixing. Naturally, there were things that I learnt along the way and, in retrospect, things that could have been done better. On the new album, I was once again the producer, but this time I brought in a whole lot more experience with me and had a clearer picture of what needed to be done to get a GREAT sounding album. So, you could definitely say that the new album is a natural progression from Ruff Justice. It’s actually the first time in the history of the band where the same band members have recorded under roughly the same conditions, in the same studios, with more or less the same equipment and with the same producer. For the first time, you can hear continuity from one album to the next, so I’d say if you’re a fan of Ruff Justice, I bet you’ll enjoy this new album the same, if not even more!" The band explores a wider range of styles than ever before on Forever Wild. From the hard rocking and anthemic opening track “Wicked” to the AOR inspired upcoming single “Silent Thunder”, to songs like "Eagle", that sounds like it came off a BON JOVI album circa 1986, CRAZY LIXX manage to blend a love and reverence for ‘80s hard rock with their own unique stamp on each track. Rexon continues, "I think the way the album turned out has a lot to do with the current line-up that we established in 2016. I’ve always been a fan of melodic hard rock and hair metal, but with previous members, we’ve been pulling a bit more in different directions at times, so the result hasn’t always gone towards the goal I’d like them too, certainly not as much as it has on this album. I can honestly say that the way CRAZY LIXX sounds today is a lot closer to how I envisioned the band to sound in the early 2010’s (around the time of New Religion) than how we actually sounded 5-6 years ago." 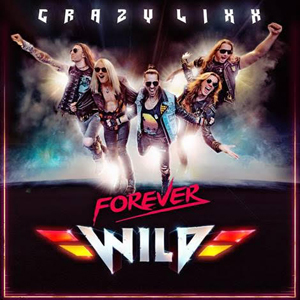 With Forever Wild, CRAZY LIXX have set the bar very high against their own revered and celebrated catalog. Their best album yet? We’d say so! Confirmed dates are below, more to be announced soon!